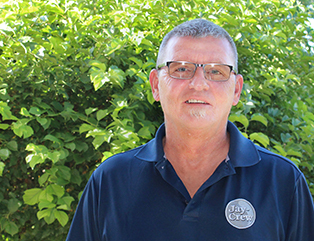 I am Rick Pedigo, the Irrigation Superintendent at Jay-Crew. I am originally from Indianapolis and moved to Muncie in 2003. I am a licensed Backflow Prevention Assembly Tester, certified by the state of Indiana, and have over 30 years of experience in all things irrigation. As the Irrigation Superintendent, I oversee the entire irrigation department for Jay-Crew including the scheduling of projects and time entry of each team member. I am responsible for ordering and overseeing the supplies needed to do our job efficiently. I also participate in the field work including repairing irrigation systems, regular maintenance, and the design and installation of new systems. Nothing makes me more proud than knowing that my team’s work makes commercial properties look their best. When I’m not working, I enjoy family time. My 3 children range in ages from 6 months to 36 years. I don’t miss an opportunity to watch the Colts games with my son, and I also enjoy camping and racing. I proudly sit on the Board of Directors for the Serenity Club, a facility that provides affordable meeting space for all types of recovery programs. I find the work I do for this organization and for Jay-Crew are both very rewarding!